My name is Morgan, I'm 11 years old, and my favorite flavor of ice cream isn't actually ice cream. It's rainbow sherbet. 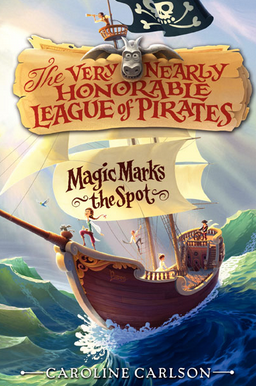 I read The Very Nearly Honorable League of Pirates #1: Magic Marks The Spot because my mom got it for me and it looked really cool. My mom is usually pretty good at picking out books I'd like. She knows my style. I'm not sure I can give a favorite part without giving something away, but I can say that there are tons of twists and turns in this story. Hilary really, really wants to be a pirate, but she can't because her father says she has to go to a fancy girls school and girls can't be pirates. If someone told me that I couldn't do something because I'm a girl, I'd do the same thing Hilary did and do it anyway. Girls can do everything boys can do! I would tell my best friend that this book has everything you could want... magic, awesome characters, adventure, and suspense. It will always keep your interest because there are no boring parts! I love the book's cover because it shows the main characters. I really like when the cover has pictures of the characters, because then I can picture them more easily when I read it. Yes! I'm very excited that this is Book #1, which means there will be a Book #2! I want to go on more adventures with Hilary and the gargoyle (he's my favorite character and I wish I had a talking gargoyle). This book is quite unique. It's one of a kind, but if I had to pick one, I'd say Tuesdays at the Castle. I would like to know what gave her the idea to write a book about a pirate. "I've always been interested in pirates--the fun, adventurous pirates in books and movies, not the real-life, much scarier ones. When I was growing up, I dreamed of finding a mysterious map marked with an X and searching for buried treasure. During the summers, my friends and I would go on treasure hunts all around our neighborhood. Those expeditions were so much fun that many years later, when I finally sat down to write a pirate story, I decided to send my characters on a treasure hunt of their own. Pirates are usually known for being frightening and violent, but I prefer my pirates to be a little bit goofy and slapstick. Lots of the fun of writing MAGIC MARKS THE SPOT came from trying to put my pirate characters in as many silly situations as possible! Thanks for your thoughtful answers, Morgan and Caroline!